UNDATED - The Kansas sunflower crop is right on schedule - 93 percent of the sunflowers there are reported blooming, which is on track with last year's 94 percent and 92 percent over the past five years, reports the National Sunflower Association, Mandan, N.D.. Petals are dry on 26 percent of the sunflower crop, consistent with both last year and the five year average. 66 percent of the sunflower crop in Kansas is in good to excellent condition. North Dakota reports 72 percent at dry petals and 35 percent at bracts yellow. This compares to 76 percent and 49 percent, respectively, last year. South Dakota is reporting 95 percent of its crop is blooming, whith 34 percent -- on target with last year -- at dry petals and 6 percent at bracts yellow. 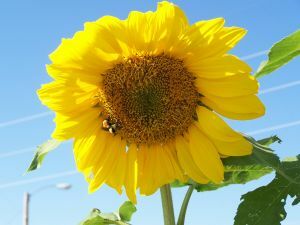 The Minnesota crop is rated 89 percent of its sunflower crop at good to excellent. Dickinson, N.D., area producer Art Ridl says his sunflower crop is right on schedule. He says he just finished spraying his 1,900 acres of high oleic sunflowers for weevils and they should be ready for harvest by mid-October. Despite a lack of rain, Ridl says about half of his sunflower crop should be a good crop.